Minvera, The American Queen of Mystery was a female escape artist whose career seems to fall between 1904-1913, her real name may have been Margaretha Gertz Van Dorn. I am not 100% certain of this due several different sources giving different names. In an interesting revelation by Hardeen in the Conjurers Monthly Magazine, he states he met with H.W. Snelling of Newcastle on Tyne, and he was surprised to learn that Snelling's daughter was married to Vano The Handcuff Expert (real name Edward VanDorn). This was the Dec 1906 issue of Conjurers Monthly Magazine. So her maiden name was Snelling, perhaps Margaretha Snelling. In the December 1909 issue of The Sphinx, it mentions that Minerva divorced her husband (Vano) on Nov 19th, 1909 in Chicago. And taking this name game a step further, in July 1908 Minerva was involved in a lawsuit, and her name is listed in the newspaper as Minerva Minna Riedel of Germany. Yeah, I have no clue where that one came from, but it's definately Minerva American Queen of Escapes that is involved in the lawsuit. Was this just another stage name? It was a full year before her divorce. In the Eau Claire Leader Newspaper Feb 17th, 1910, she is mentioned in an article as being married to Prof. Chas. M.J. Haugeros. A later article March 20, 1910 mentions that she married her manager. So Chas Haugeros was her manager and her second husband. 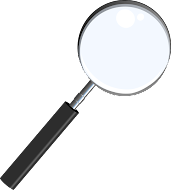 One of the keys to figuring out Minerva, the escape artist, is her first husband Edward Vano, or real name Edward VanDorn. I've been able to date his act back as far as 1900. He is usually listed as a Handcuff Expert. At one point he is doing a dual act as Vano & Anvo: The Transatlantic Wizards of Handcuffs. This comes from the July 1900 issue of Mahatma. I'm curious who the Anvo might be. They are listed again in the May 1901 issue of Mahatma. Then in June 1903, there is a mention that Vano is moving to Coney Island. In a 1903 edition of The Sphinx, it says that Vano will appear in a new act called 'Vano The Mystery', and he will be assisted by Sadie Gibney. So no sign of Minerva, yet. 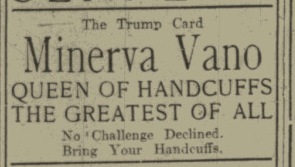 However, an ad in the Boston Post, May 25th, 1904 lists him as appearing at Austin and Stone's Museum as The VanDorns King and Queen of Handcuffs, so it's likely that Minerva is in the act at this point. 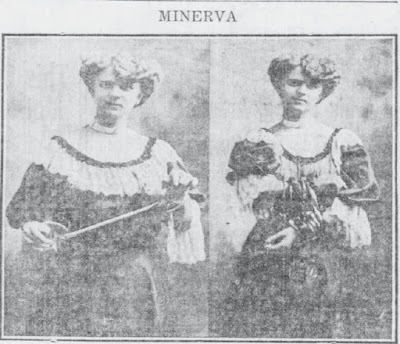 By September 1907, Minerva was appearing solo with her husband acting as manager. 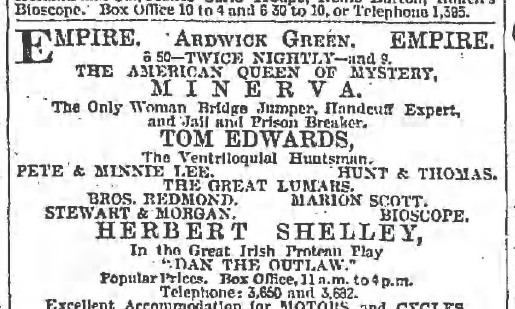 Her billing at this time was Minerva Vano: Queen of Handcuffs. It wouldn't be long before she dropped the last name Vano and just went by Minerva. And as we learned above, she would also drop Mr. Vano. 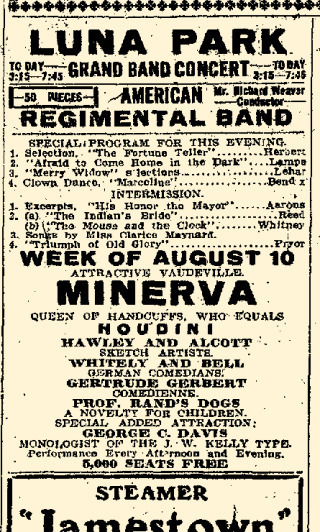 There is a bit of excitement in July 1908 when Minerva is contracted to perform at The Merryland Park in Cumberland Maryland. She is set to be paid $75 for the week. The manager of the park asks if she can add something sensational to promote her appearance, which she does with no additional fee. She is handcuffed by the Chief of Police and jumped from The Blue Bridge into the Potomac River. The newspaper article which features the jump, also points out that Minerva has escaped from 173 jails, 63 of which were in America. That sounds exciting, but it wasn't the excitement I was referring to. Apparently on Wednesday of her week at Merryland Park, Mr John Kirk, the park's manager, went to Minerva's hotel. Here is how the Cumberland Evening Times newspaper describes the event..."Mr. Kirk came to the hotel and after some discussion with Mr. Johnstone, her assistant, came to her and using very insulting language, but not complaining of the act, made a most insulting proposal which she resented and warning him of arrest if he continued to insult her, walked away. He followed her and said, "Ill fix you for this." Then on Thursday, she showed up at the park to fullfill her contract but was prevented from doing so. She was told to go to the box office to pick up her money and leave. But they only paid her a portion of what she was owed. So she sued him. Minerva won the lawsuit. The following month Minerva appeared at Luna Park DC in Arlington VA. I found this personally fascinating because I had never heard of Luna Park DC. Apparently, there was an Amusement Park in Arlington along Four Mile Run Road and was quite popular until it eventually burned down and was razed in 1915. While performing at Luna Park, Minerva also did a handcuffed bridge jump. She jumped from the New Highway bridge into the Potomac River at 5pm on August 10th 1908. The newspaper account says that she may try to duplicate the feat later in the week but instead of wearing handcuffs she would be put into a straitjacket and attempt the dive. I could find no report of that taking place however. In late 1908, Minerva heads to England for a tour that would last 14 months. touring England and having a very successful run. While in England she does handcuffed bridge jumps, jail escapes, challenges and finished her act with her signature Water Filled Barrel escape. This was similar in effect to Houdini's Milk Can Escape, but used a wooden barrel instead. Also, Minerva was heavily shackled and handcuffed when put into the barrel. 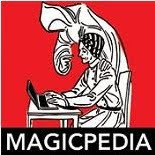 According to the Jarrett Book, it was while Minerva was in England that she encountered 'the Houdini people'. Her accusation is that they put acid into the water of her Barrel and she was badly burned when she entered. She stopped the escape immediately upon feeling the burning sensation. I don't see any newspaper articles which refer to this or any other form of documentation other than Jarrett's account in the Jarrett book. 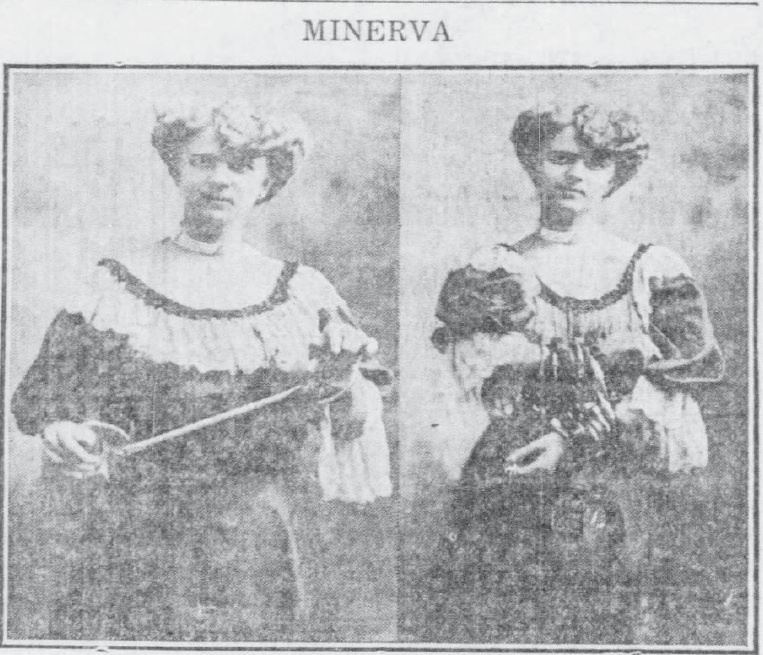 By October of 1909, Minerva is back in the United States presenting her act. Her name regularly appears in The Sphinx Magazine as touring the U.S.. The article I mentioned earlier from 1910 where she marries her manager, also states they were in Russia. But the way the article is written, it doesn't give the exact time they were in Russia, so it is possible this was 1910 or earlier. According to Jim Steinmeyer in the Jarrett Book, Minerva marries Guy Jarrett sometime around 1913. So if all of this is correct, Jarrett is actually her third husband. They remained married for seven years until she divorced him for abandonment. Minerva appears to have given up her career when she married Jarrett and there is no record of her after this time that I can locate.